Why are 'Effects' Commonly to Spatial-Sequence Synesthesia Highly Suggestive of Diary & Appointment Functions? How would Functions of a Diary Neural Implant Enhancement 'Interface' with the User? On the previous page I pointed out the ‘characteristics’ that you would ‘expect’ of the workings of an ‘alleged’ writing, reading, spelling and written ‘comprehension’ learning aid neural implant AND that these characteristics have been documented as being directly associated with grapheme colour synesthesia ‘visual’ effects and abilities. On this page we are going to explore the possibility of people having an invisible diary and appointments implant in their head to. As a start, ‘IF’ we are ‘generally’ simulating people with ‘invisible’ neural implants then ‘statistically’ it is extremely likely that we will have people here with an appointments diary, scheduler and even perhaps a task manager. I state this because these are a common feature of and are commonly used by many people with a computer and a smart phone. So, let’s just imagine such an implant functioning in slightly greater detail. Within your INNER visual space this implant will likely display say a weekly or monthly calendar with brief entries marked and accessible in greater detail for specific days of specific weeks. You are also likely to be able to mentally select a day and have any entry automatically presented ‘in full’ to provide you with greater details ‘IF’ needed. Just by your ‘thinking’ including certain key words ‘DIARY / NEW ENTRY / THIS THURSDAY’ while mentally sub vocalising or even perhaps just ‘thinking’ of what you want placed into that entry will result in what you are saying or THINKING ABOUT ‘in your head’ being automatically converted into text and words and then automatically entered and saved as a diary entry. Let’s just evaluate what would be the day in day out ‘visual’ attributes that are ‘absolutely’ common of every single diary, appointments and event scheduler application? What would these be? Well, every single ‘diary’ will absolutely ALWAYS display ‘YEARS’ (likely in ’20XX’ number form), it will also display months of the year and days of the week for months. That’s the whole point of a ‘diary’ as it’s a reference to schedules and appointments related to ‘fixed’ generic year, month and days of week terms that everyone is familiar with. The above would be the ‘obvious’ words associated with a diary neural implant, however, it is possible that for children you’d also have words associated with daily and weekly schedule of say school subjects and lessons too!!! Despite that this sort of obvious ‘digital’ functionality happening inside anyone’s head would be unbelievably bizarre and UTTERLY ANOMALOUS, ‘IF’ we do have people with an invisible neural implant carrying out common diary functions that would at least for some people likely be accessed regularly then you could deduce and hence EXPECT that ‘STATISTICALLY’ it is highly likely that the above listed numbers and words would ‘magically’ appear in their ‘visual’ field with a much HIGHER incidence compared to other numbers and words that also perhaps ‘somehow’ just automatically magically appear!!! ALL web pages discussing these areas that offer comments present yet more examples all confirming the above. How would a diary implant ‘visually’ present months or weeks or days to the user? Well, when you first just ‘think’ about accessing a ‘diary’ function it is then likely to automatically present current day, week, or month depending on what you are thinking about in actual ‘diary’ terms. 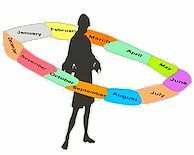 So, if you were thinking in long-term ‘month’ or ‘year’ possibilities then the diary visual display presentation would likely automatically ‘select’ the ‘scale’ that you (consciously or unconsciously) want to view. Also, different people, depending on what they REGULARLY accessed would likely have a specific ‘scale’ or ‘view’ more often presented compared to other possibilities. So, for some people the visual diary entry is likely to be automatically focused on the ‘month’ presentation, while for others, for school kids for example it is likely to default to their current ‘days’ lesson schedule. So, you are likely to have a visual ‘eye’ sight presentation with the main diary entry that you are most interested in, appearing as part of your visual FIELD OF VIEW i.e. it would be OVERLAID onto your normal ‘visual’ view such that the ‘month’ or ‘day’ or YEAR’ presentation would appear to be visually projected INTO THE EXTERNAL ENVIRONMENT. Coincidentally, one of the many variations of synesthesia is called ‘spatial-sequence synesthesia’. Why are ‘Effects’ Commonly to Spatial-Sequence Synesthesia Highly Suggestive of Diary & Appointment Functions? Spatial-sequence synesthesia, is a ‘condition’ in which people automatically perceive sequences of related visual ‘items / terms’ in ordered spatial patterns. 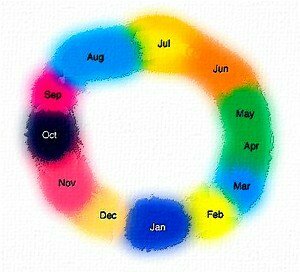 Research has shown that individuals with this specific synesthesia variation have superior memories and therefore superior abilities to recall things like dates and events much better than the average person. Coincidentally, this condition is very specifically associated with the display of information that just happens to correlate with what you would expect of ‘terms’ that would be associated with an invisible DIARY implant. Below are some images that ‘represent’ how people ‘see’ sequences of ‘months of the year’ visually projected ‘externally’ as if these months are circled around themselves within the external environment. Left image is from here and the right image below is from here. What known neurological function could or which have perhaps been DESIGNED to visually ‘project’ as a ‘coherent’ spatial sequence matching the names commonly used to describe the months of the year that are coincidentally IN THE CORRECT ORDER, also, automatically and INVOLUNTARILY? Perhaps it’s the little know lower ‘diary functions’ ganglia that is found just left of the upper ‘spelling aid with cartoon character definer’ neuron complex!!!! Below is an image ‘representing’ someone’s spatial visual ‘view’ of ‘days of the week’ (the image above is from here (the same page also presents other examples of ‘projected’ diary displays)). 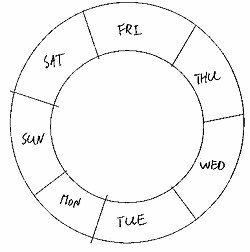 If you want more in-depth details of someone describing their experiences of having spatial sequences of months of the year, days of the week AND hours of the day then read this page here. For a general page of images ‘illustrating’ the visual presentations associated with this type of synesthesia then click this link here. Coincidentally, my very basic calendar / diary ‘add on’ as part of my thunderbird e-mail software offers different themes that change the colours of the diary presentations. I also have options to change the way that weeks, months and years are visually presented too. How would Functions of a Diary Neural Implant Enhancement ‘Interface’ with the User? Coincidentally, the adjustable possibilities available to a neural implant diary interfaced to and directly integrated into the visual cortex that is likely to be designed to offer the best functionality to as many different people as possible (to fit in with how different individual’s minds and personalities ‘actually’ work) are likely to be ‘extensive’. It is also highly likely that on activation such an implant would load and initiate a set of visual preference examples, ‘tests’ and options. The set-up software is likely to also monitor your feelings and responses to each of the presented visual example possibilities and or options to help it more automatically determine which combinations of these (visual diary display presentation and which colours to use for ‘what’) work best for yourself. 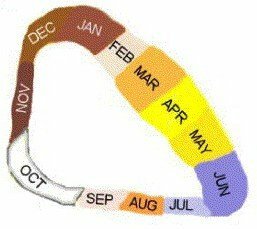 For a diary implant it also wouldn’t be unreasonable to expect that each day of the week, each calendar month and even each ‘year’ (1979 for example) could be individually colour coded. The best or most suitable visual presentation combinations of months etc and the colours, font, point size and the type of subliminal commands used to interact with this implants functions would then likely be permanently fixed for that particular implant. It is also likely that an implant of this sophistication would also continually monitor the ‘user’s’ ease of use of the implant over time AND maybe even suggest alterations and adjustments every so often. As this and other implants would be interfaced into and ‘processing’ the data being passed by the optic nerve it would be quite easy to insert additional ‘data’ to allow the diary ‘views’ to be directly and interactively presented as part of the user’s visual input. This would result in the diary presentation being overlaid onto whatever ‘external’ scene is currently ‘in view’. As such the parts of the ‘diary’ that the user interacts with will appear to be projected into the external ‘environment’. Coincidentally, if you read through people’s descriptions of their diary / calendar presentations this is how it appears. I should also reiterate what I have already made clear above, which is that extensive studies of synesthesia ‘experiences’ have resulted in them being described as; “involuntary non-suppressible, AUTOMATIC’. In other words: these are not ‘learnt’ procedures, these people have not spent weeks and months sitting and training themselves to absolutely consistently ‘automatically’ remember dates etc while also learning to visually ‘manifest’ how they ‘interact’ with and UPDATE, EDIT and CHANGE their internal ‘diary/calendars’ information. As most people exhibiting synesthesia became aware that they had these abilities when they were a very young age, (many just 3/4 years old and some younger), then are we expected to believe that these people, at that age somehow ‘designed’ a visual diary memory system and one which often functions in ways that are neurologically ‘impossible’. A visual diary and calendar ‘memory’ system with ‘automatic’ (non-suppressible) functions that are involuntarily and automatically provoked while also being seamlessly integrated with each persons own internal, mental and or subliminal functioning and or feelings.